A few weeks back, Suraj told me to keep specific days during the first week of May free, because he had a surprise booked for my birthday. As the date approached he told me what I needed to pack and the time I needed to be ready etc. Then the day finally arrived. I was clueless about what was in store and I loved it! We went to Kings Cross, then we walked towards St. Pancras, and finally we followed the signs for the Eurostar. At this point, I knew we were going out of London, but there's a number of destinations that we could have been travelling to. Soon after, we checked-in, I knew we were Paris-bound. 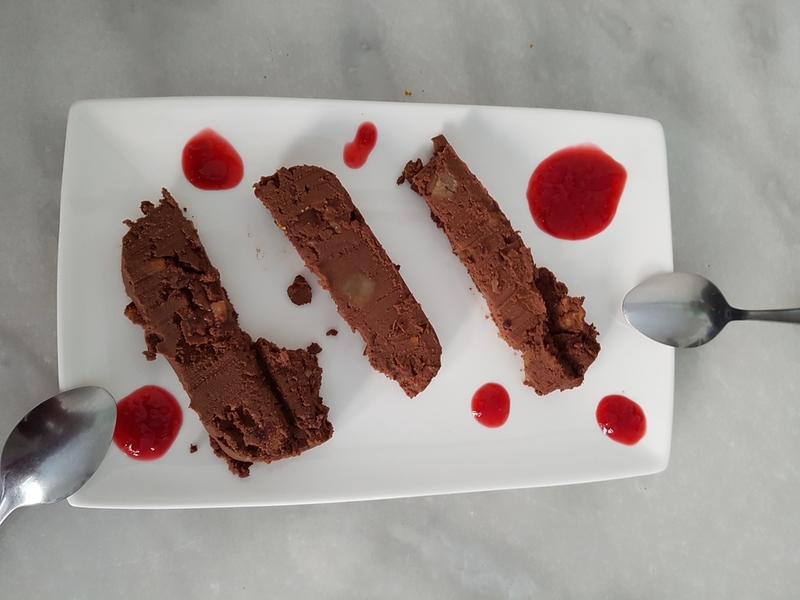 At first I remembered what I'd experienced before, but then I honed in on how much I trust Suraj, and know that he would have researched vegan places to eat, so it would definitely be a different to what I'd experienced before! After the journey on the Eurostar ended, we used the Metro to travel to Bastille. Suraj had booked a gorgeous studio flat through airbnb. It was on the 6th floor and the view was absolutely stunning. It was (positively) weird, because we were in a busy place, yet we couldn't hear much of the hustle and bustle. It was great! We checked-in to our flat, freshened up and went for lunch. I was chuffed to find out that we were about to support a small, vegan business. We were lucky enough to be able to sit outside as the weather was gorgeous! This lovely young lady called Céline came out. She explained what the options were, and she did what any good waiter/waitress should do, BUT there was something about her manner that made the experience better. Céline didn't just look after us, she was friendly, bubbly, honest, diligent, humble and to name just one more quality, really helpful. When she heard that Suraj had brought me to Paris for a surprise, and that we were both vegan, she offered to guide Suraj (when I was out of earshot), about where we could/should go eat, in case he got stuck or felt unsure. She made the whole atmosphere of the Café homely, friendly, relaxed, and it felt as if all the customers mattered to her. Suraj and I went for a stroll after lunch. Usually, I like to know where I'm going, but it was bright and warm, and at that point, I had gratefully accepted that Suraj had surprises planned throughout our stay in Paris, so I happily walked without the need to know anything about where we were going. 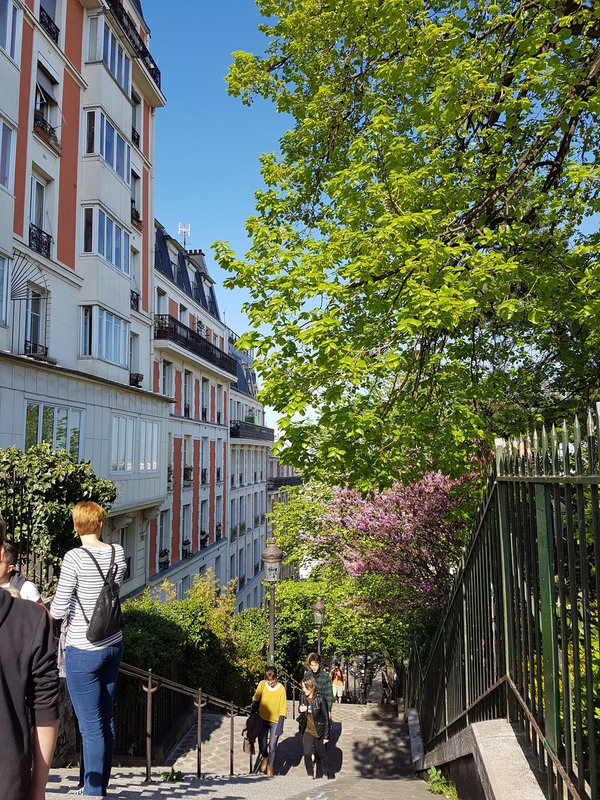 I appreciated the flowers, buildings and other sights on the way and was then blown away by the view as we reached Sacre Coeur. I would definitely recommend going inside Sacre Coeur if you visit Paris. For dinner, Suraj took me to another small vegan business. This restaurant has a delicious range of burgers, along with a number of meal options. We went for the option that included a burger, side, drink and dessert. It was delicious! The seating in Hank is cosy, and it gets pretty busy. The system they have in place to order what you want works well. You order your meal downstairs, pay for it, find a seat and then wait until your name is called, after which you go and collect it. The fixtures and fittings use the space really well. Most of the tables have shelves for customers to keep their bags and hooks for extra layers. The meal was delicious and we would have happily returned, had there not been so many vegan places that we hadn't tried out yet! La Pain Quotidien in Charonne, was a couple of minutes away from where we were staying. So, for that reason, because most places don't open before noon, and because they have an amazing vegan menu, Suraj took me there for breakfast. I couldn't believe how different the menu was from that in other branches of La Pain Quotidien in London. There were more vegan options for sure! 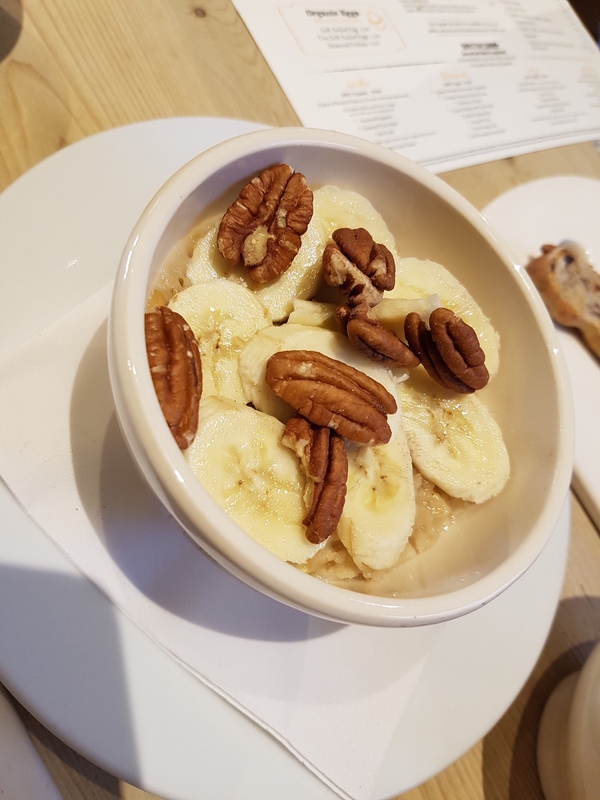 We enjoyed a delicious banana porridge, an apple and cinnamon muffin and a hazelnut and raisin flute. 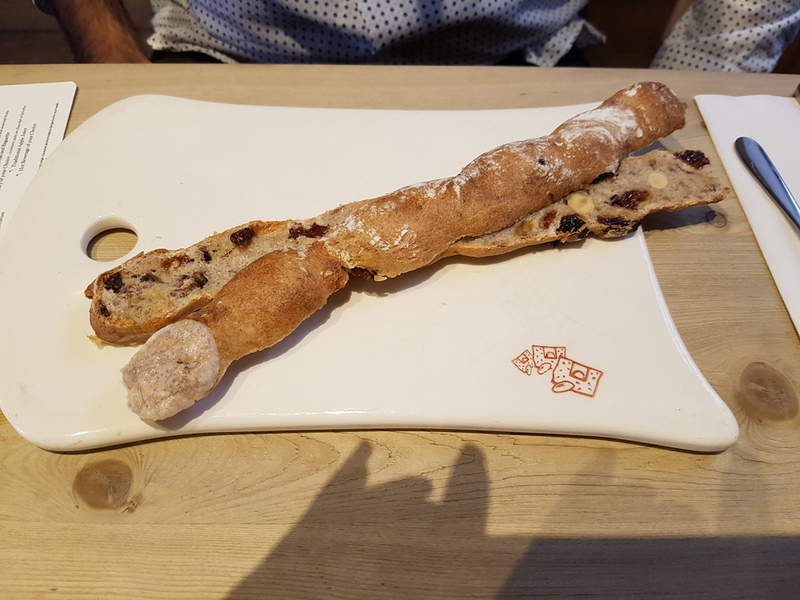 Here's some snippets from the menu at La Pain Quotidien in Charonne. After breakfast at La Pain Quotidien, we went on a walking tour of Paris. We found out about these walking tours when we were in Barcelona, and we really enjoyed them, so I was excited about doing the same in Paris. During the tour we learned about Fontaine St-Michel; Cathédrale Notre-Dame de Paris, Musée du Louvre, The River Seine and more. After the walking tour, we went to Carmen Rogasta's for lunch. This restaurant is within a boutique and everything is vegan! Customers can eat and shop in one place, feeling happy that, as far as it was possible, the environment and animals weren't harmed in the process of sourcing or making any of the products being sold! We needed to keep lunch light, because what Suraj had planned for dinner was something he knew I'd want to have lots of tummy space for! Alos, the booking was a little early, which meant that there was also a short gap between lunch and dinner. For that reason we shared the plate of food shown below, but refrained from ordering an extra dessert. 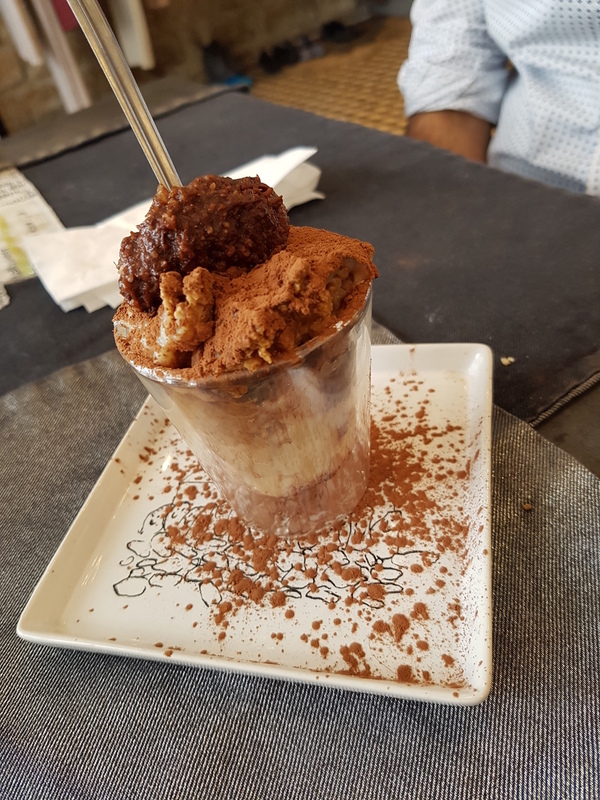 If the Tiramisu was anything to go by, the other desserts would have been divine! Wow! What a meal! Again, the weather was gorgeous, so we sat in the veranda, which made the meal even more special. The staff had the right balance between being attentive and giving us space to enjoy our meal. They were polite, jovial and gave their honest opinion, (along with customer feedback), about items on the menu when we wanted a little guidance about what to choose. The size of the portions was just right, the flavours were delicious, the colours were rich and vibrant, and the presentation was elegant and stylish. We checked-out of the room earlier than we needed to, left our bags with the owner, and walked to Le Potager du Marais to enjoy a delicious brunch. Suraj wasn't too sure about how our final day would pan out, so he hadn't booked a table at this restaurant. However, we had got there before it opened, and were hopeful that we'd be seated. The veranda was fully booked, so we sat as close to it as possible, which allowed me to enjoy the sun on my back. The owner was charming, attentive, patient and had a great energy. It was a pleasure to be served by him. Suraj had heard that Le Potager du Marais serve European food with lots of traditional French dishes. He also remembered how much I enjoyed French Onion Soup when I was in France before going vegan, and of course, they served it! So we ordered the French Onion Soup, a Roast Potato with Olive Tapenade and Sprout and Hazelnut Pesto, the Spinach-Walnut Lasagne, and Chocolate Mousse. I'd definitely recommend a meal or more at Le Potager du Marais. After having brunch, we walked to Cathédrale Notre-Dame de Paris. Luckily the queue was fast moving so we managed to go inside within a very short time. It was amazing to see the effort, detail and vision that had gone into making the Cathedral what it is today. Soon it would be time to board the train, so we walked back to the apartment, got our bags and got some salad, a baguette sandwich and a muffin to-go from La Pain Quotidien in Charonne. Here's some of the vegan places we didn't get to! Myth busting: "Vegans can't travel and stay vegan!"